The Austrian Embassy in cooperation with the National History Museum brings the exhibition titled "Austro-Hungarian Monarchy and Albania in 1916-1918". The conference and exhibition will be open on Saturday, January 26, 2018 (10.30 - 17.00) and on Saturday 27 January 2018 (from 10.30 - 14.20) at the premises of the National Historical Museum in Tirana. 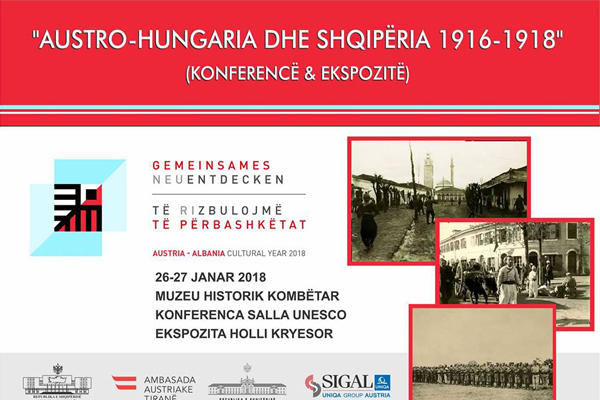 The conference aims to bring in memory the period 1916-1918 (period in which Austria-Hungary administered more than half of Albania's territory). Academics from Austria and Albania will recall the events of that time, which shape and influence the relationship between the two countries to this day. The conference will address topics such as "annexation or protectorate" and Austrian influence on infrastructure, politics, administration, economy, culture and education. Within this framework there will be also an exhibition with photographs of that time.